Manish Shrivastava (left) and Joel Thornton (right). Working together as a group can accomplish more than working separately. That's just what researchers had in mind when they proposed a roll-up-your-sleeves workshop to tackle secondary organic aerosol (SOA). The first of its kind to solely address SOA, the workshop brought 23 top scientists from universities, national laboratories, and research organizations to Pacific Northwest National Laboratory. 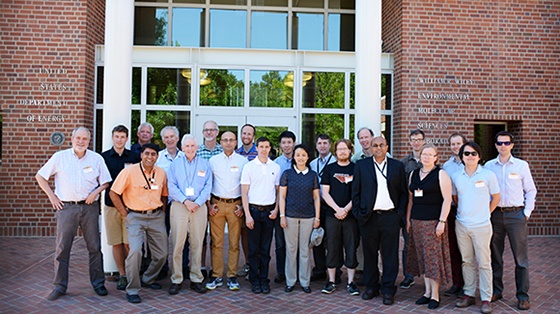 Led by PNNL's own Dr. Manish Shrivastava and University of Washington's Prof. Joel Thornton, the workshop was sponsored by the U.S. Department of Energy's Atmospheric System Research program. The workshop was focused on discussing SOA, tiny atmospheric particles formed by interactions between human-caused pollution and natural compounds given off by vegetation and trees. Many of these interactions have only been discovered in the last five years, and climate models may not include the latest experimental data. This can lead the models to underestimate the number and importance of SOA, which have impacts ranging from cloud formation to global pollution movements and can directly affect human health. Digging into the new measurements could transform the way scientists think about natural sources of aerosols, as anthropogenic (human-caused) effects can drastically change the amount of biogenic (naturally occurring) particles. From the beginning, the event was organized by Shrivastava and Thornton. "Joel and I discussed how we could integrate findings from latest measurements of anthropogenic-biogenic interactions and use them to look at climate impacts from fresh perspectives," said Shrivastava. "This needed a fleshing-out of the latest science findings from measurements, which could enable us to take larger steps toward solving some of the major questions related to effects of SOA particles on climate change. We went to our DOE sponsor, and they were enthusiastic about the idea of a workshop, too." Because it was structured as an interactive workshop, both modeling researchers and those who specialize in collecting data were able to discuss and generate ideas, face-to-face. This workshop is expected to build long-term collaborations between climate modelers and experimentalists. Participants in first-ever SOA Workshop pause to commemorate the gathering. The collaboration between Shrivastava, a modeler, and Thornton, an experimentalist, was an important component of the workshop experience. Models can reveal new insights when they have specific sets of data to work with, but there can be a gap in understanding between models and the most recent insights from measurements. "We were able to bring together top researchers in both areas, which helps bridge the divide that can occur," Thornton said. Armed with their combined knowledge from the workshop, Shrivastava and others are making advances in understanding the role SOA play and their impact on climate. "Instead of individuals making separate impacts, we can make a bigger impact as a group," Shrivastava said. 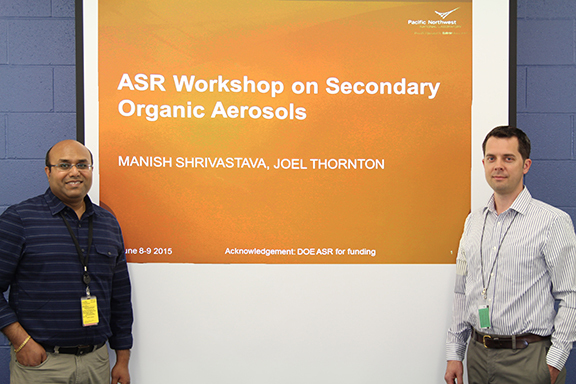 "When the best minds in the aerosol field collaborate, we can work together to take SOA science in new directions." Shrivastava works on modeling atmospheric aerosols and how they interact with climate change. He has been at PNNL since 2009 and received a Ph.D. from Carnegie Mellon University. Thornton runs the experimental atmospheric chemistry group at the University of Washington, where he has been since 2004. He received a Ph.D. at University of California, Berkeley.